Here are the census records I have of Elizabeth O'Shaughnessy Begnal, they are 1910, 1920 and 1930. Elizabeth may or may not have married George Felix Begnal prior to my grandfather Clifford Franklin Begnal being born 31 Mar 1903, Utica, NY. I have no birth info for either Elizabeth or Clifford to confirm. Per Elizabeth's death certificate, she was b. 6 Sep 1888, Utica, NY, d. 8 Jan 1949, San Francisco, CA. The informant of this death certificate is her son Clifford Franklin Begnal. There is a chance Elizabeth was born 1882 as the 1900 census suggests. 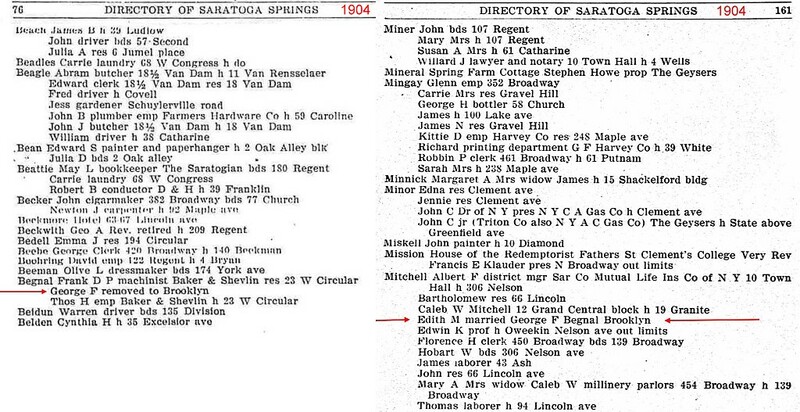 1900 - John J. Shaughnessy, Mary died 1894, living at 146 Howard St. Utica. Children: Sarah, William, Anna L., Lizzie (1882), Mary L., Ella. As of 29 Dec 2016, I learned my Bio Great Grandfather is Claude B Eaton, not of the Begnal Surname Any & All Reference to George Felix Begnal or of the Surname Begnal is the result of 23 yrs researching presuming Begnal was my Grandfather Clifford Franklin Begnal's birth name and lineage. 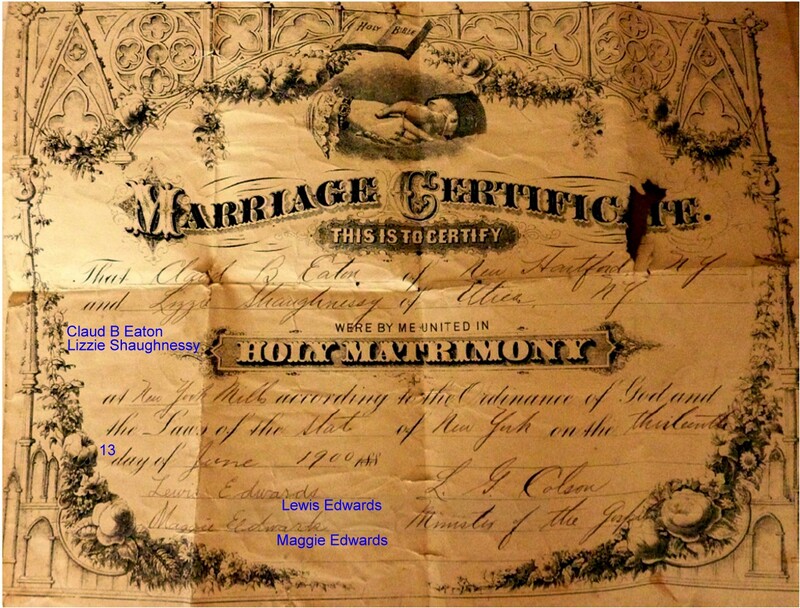 I now have conformation that Elizabeth Shaughnessy did in fact marry 13 Jun 1900, New York Mills, Oneida Co., NY to Claude B Eaton of New Hartford, NY. 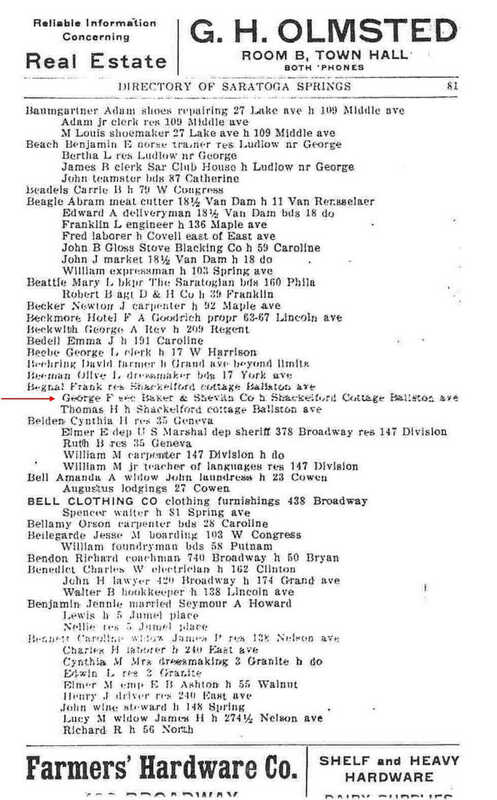 Elizabeth did in fact know and lived with George Felix Begnal for a few years, unknown specifics of their relationship, nor is it known if any children were born unto Elizabeth & George. Presumption at this point based on the following marriage certificate of Elizabeth "Lizzie" Shaughnessy and Claude B Eaton that Clifford Franklin may have been born unto Lizzie and Claude. 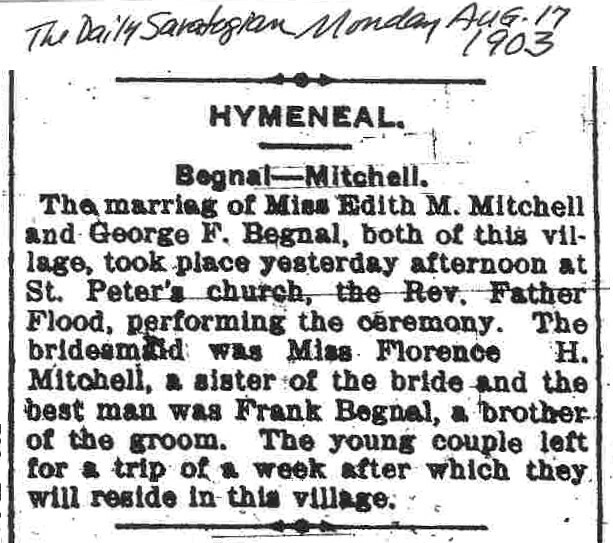 Before 1907, I cannot find any records that Elizabeth & George F Begnal knew of one another. 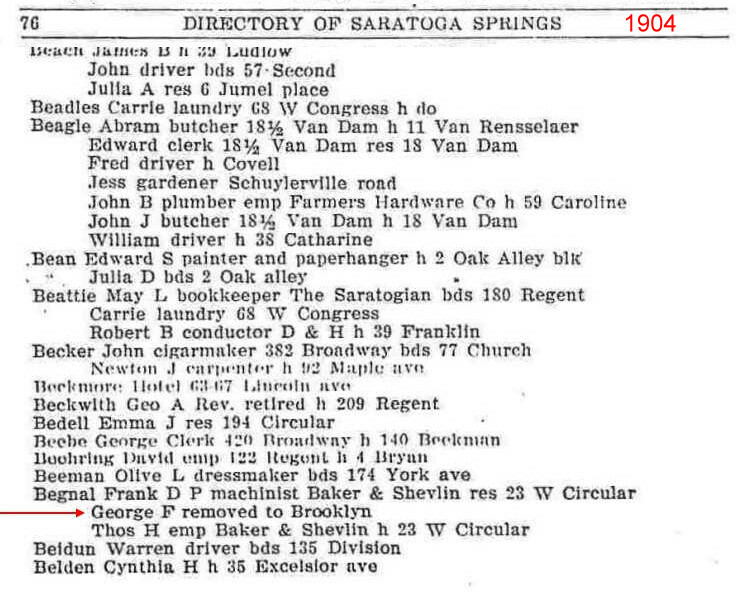 indicating she had not married George prior to 31 Mar 1903, when Clifford Franklin was born. Having received the following Marriage Record it is my assumption that Claude B Eaton is the biological Father of Clifford Franklin. 2 Jan 2017, I am in the process of locating birth information to confirm. 1903 - George F., Frank & Thomas Begnal, Baker & Shevlin Company, h. Shackleford Cottage, Ballston Ave. Saratoga Springs. 1905 – Mrs. Edith M. Begnal, 139 Broadway. Frank P. Begnal, machinist Baker & Shevlin, res. 23 W. Circular, Thomas H. Begnal. 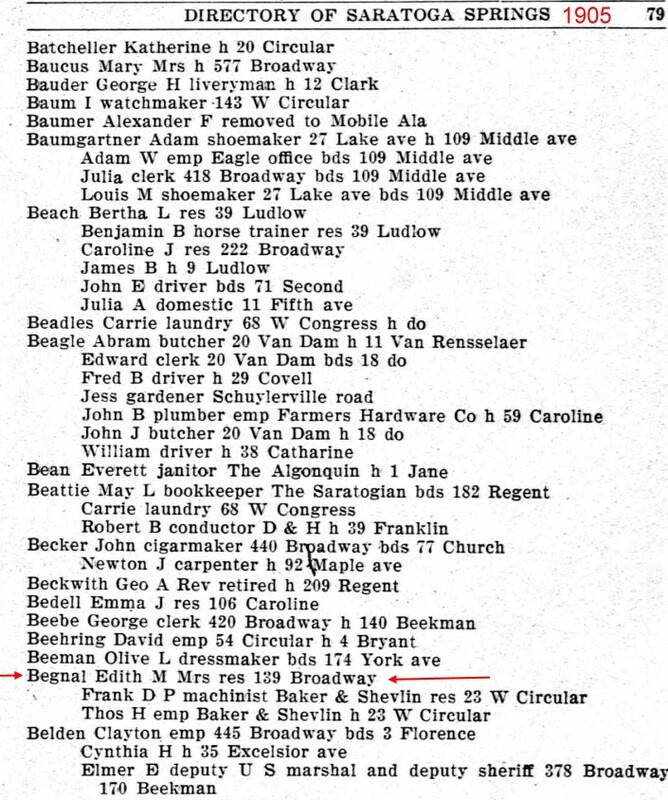 1910 - line 69, of the Census show Clifford Begnal, age 8, born NY, mother & father born NY. Mrs. George, age 28, (1882) born NY, father & mother what looks like Ireland with English or England above/over Ireland, living at 612 Madison Ave., Seattle, Washington on 27 April 1910. Possibility the reason for her being there was to be a nurse at the Providence School of Nursing in Seattle. Today the I-5 freeway replaced 612 Madison. One of the first hospitals in Seattle, founded by Mother Joseph Sisters of Providence, located on Madison Ave. in 1910. 1920 - line 52, of the Census show Elizabeth Begnal, age 36 (1884) as a widow, born NY, parents born NY Clifford, age 16, born NY, parents born NY, living in San Francisco at 3554a 20th St on 8 January 1920. 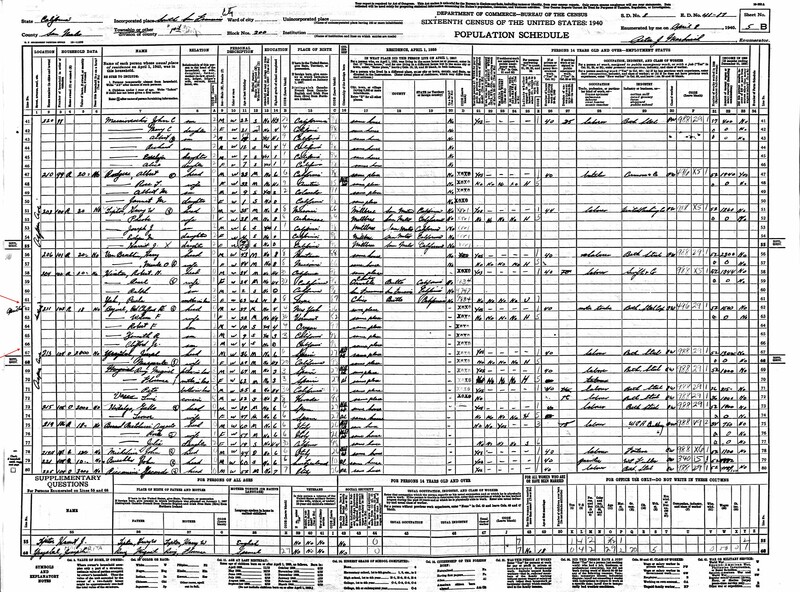 1930 - line 57, of the Census show Elizabeth Begnal, age 42, (1888) divorced, born NY, her father Irish Free State and mother born in NY. What is amazing in which I never read before today, per this census she was age 14 at 1st. marriage, which means she married after Sep 1902. Clifford Franklin, was born in 1903. She was living at 405 2nd Ave. San Francisco on 10 April 1930. Between the 1910, 1920 & 1930 census has Elizabeth as being married in the 1910 census, a widow in 1920 and divorced in 1930.